That is a face only a mother could love — and it seems like its mother does actually care for it. This is an amblypygid, one of the few arachnids that demonstrates social behavior. Learn how these predator-faced monsters show their social nature. Amblypygids are known, to those who don't want to be driven mad by spell check, as whip spiders. The "whips" are actually those two long, folded "arms" that the spider keeps in front of its face. These guys walk on six legs, with one arm (known as a pedipalp) extended and another one sweeping for food. Whip spiders have no fangs and no venom. Their most fearsome weapons is the little thorn-like protrusions on their pedipalps that they can use to hook small insects. 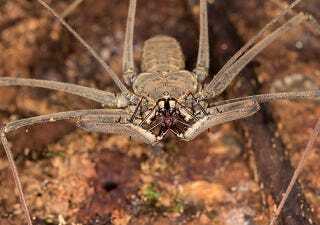 Despite living all over the world, these spiders are rarely seen (thank goodness). They stay inside caves, searching for small bugs and keeping far away from humans. This may be why it took until 2007 for people to realize they were one of the few arachnids to socialize. Arachnologists watched as female whip spiders hatched their broods and let the babies clamber onto their back. When the group was resting, the researchers noticed some behavior they couldn't explain: The mother spider constantly stroked her babies. For one species of whip spider, P. marginemaculatus, the babies stroked back. These spiders would stay with their mother up to adulthood, with everyone petting each other. Mothers and babies weren't the only ones to show social behavior. When researchers took whip spider siblings and put them in separate areas of an unfamiliar cage, the siblings would quickly find their way back to each other, and huddle in groups. Though some species did start fighting with each other as they approached adulthood, others raised harmonious, and close, families. So what do you think about this social spider that can do us no harm and only wants to be left alone? I still want to kill it.